Growing up in Indiana, I always looked forward to summer. What kid doesn’t, right? Summer meant no school and that meant lots of warm days and nights filled with fun. I remember playing so hard that when my head hit the pillow, I almost instantaneously fell asleep. Those thoughts and memories make me smile, because I love remembering how easy and wonderful life was then. 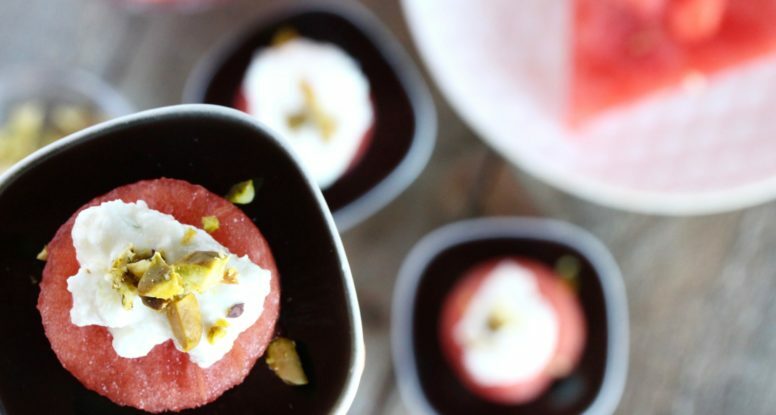 Summer to me also meant sweet, delicious fruit. And I loved it all, cantaloupe, honeydew melon, peaches, strawberries and WATERMELON! 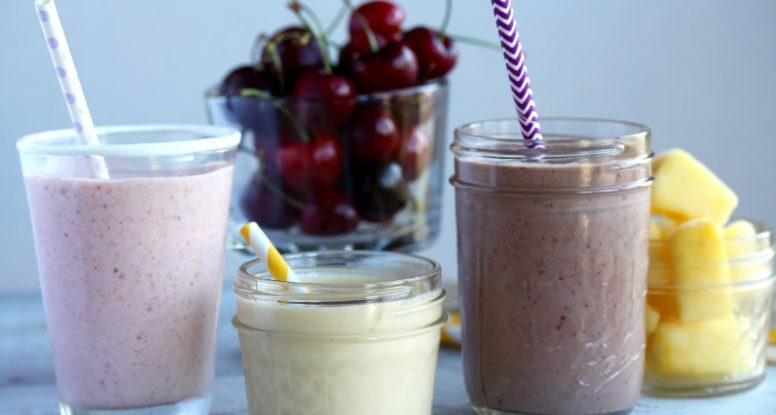 That’s right, you read that correctly, I said “Fertility Friday + Smoothies!” A random pairing? Of course not, I do everything with intention…ok, well almost everything. Today for Fertility Friday I would like to focus on the amazing nutritional power of smoothies. Yes, I know that people are crazy about smoothies these days. They make their own, they buy the fancy one that costs 10 dollars and they insist on having them every morning for their “bowl” breakfast. But this is one trend where you can believe the hype…at least to a certain extent. 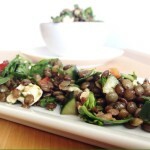 *Disclaimer – this recipe hasn’t actually won any official awards or titles. And it hasn’t been entered in any recipe contests or been featured on the Food Network. So my guacamole is technically “award-less,” however it’s unofficially a “winner” (hence, Winning Guacamole) in my small circle of nearest and dearest. 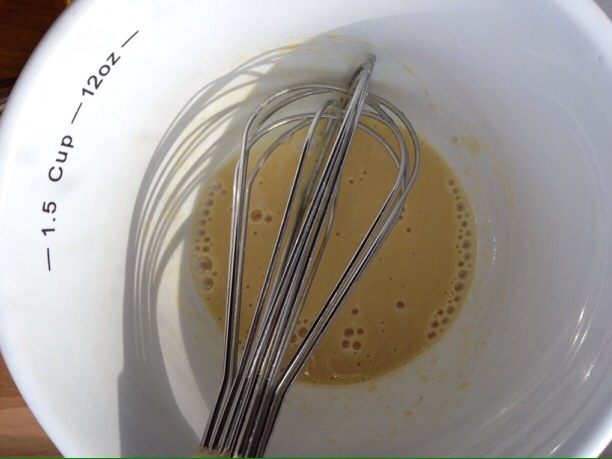 And I’m about to let you in on my not-so-secret recipe! But first, there are some things you should know. 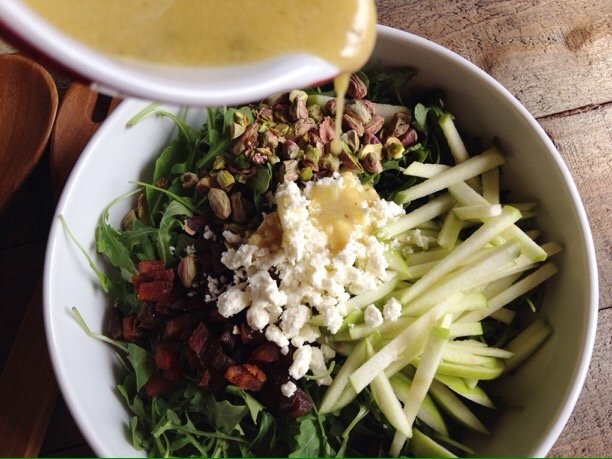 Pick the Avocado – This is a big deal, so it’s imperative you get it right. 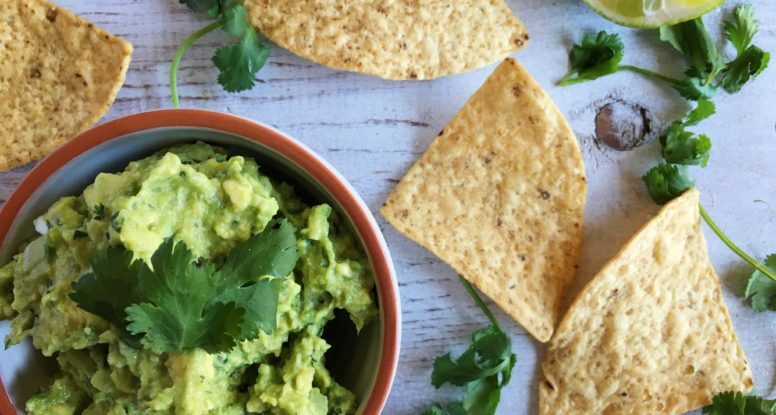 How do you choose the right avocado? Depends on when you want to make your guacamole. 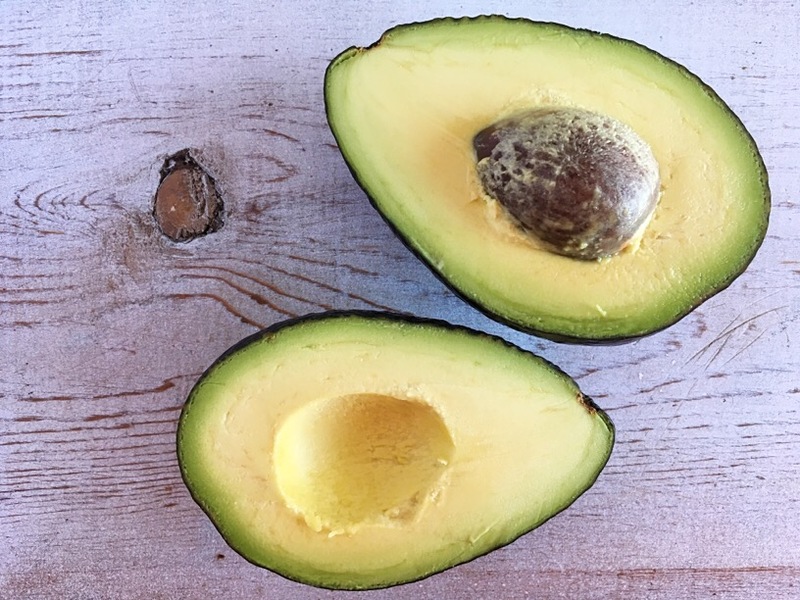 If you don’t need it until a couple of days from now, it’s ok to buy the rock-solid avocado because it will continue to ripen. If you want it tonight, buy the one that gives just a little when you apply a light pressure to it. Skip the super soft ones and the ones with dents and dings. Don’t Skip the Onion – So many people tell me they want to leave out the onion, but I encourage you not to do that. Instead, if onion causes you trouble, consider this little trick – chop it and then add it to a bowl of water. Let it sit there while you’re making the guacamole and then drain it and add it. Soaking the onion will help remove some of the bitter compounds, so you won’t have that pungent onion taste in your mouth. 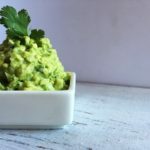 Add salt – Every time I make this guacamole someone always asks, “why does this taste so good?” It’s not that I am an awesome guacamole maker or that I have a special guacamole secret, it’s just salt. Yes, you heard me, salt. 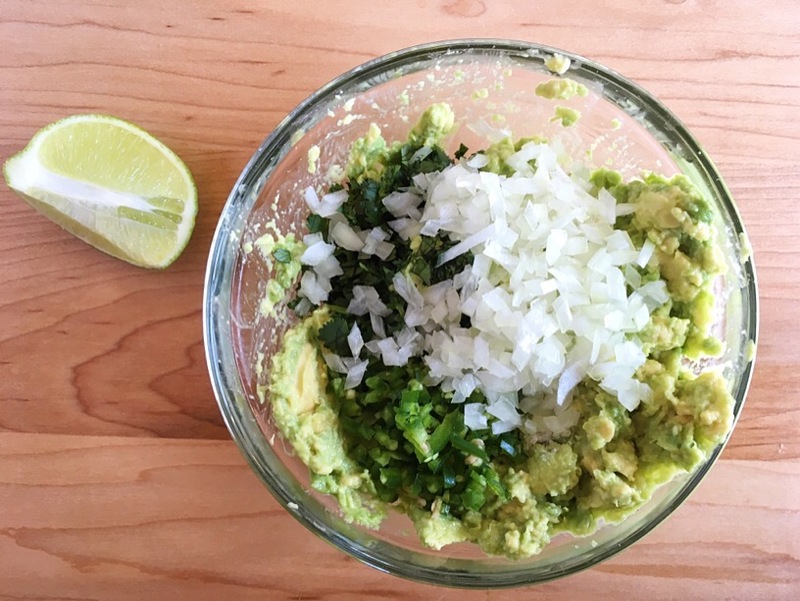 If you don’t add the right amount, it’ll just taste like mashed avocados and onion. Add the salt, and you’ve become a culinary genius! Afraid of salt, it’s ok, I understand, but in this recipe I’m only using 1/4 teaspoon of salt and that equals to about 145 milligrams of sodium per serving. That’s a relatively small amount considering 2300 milligrams per day is your cutoff. There, now you’re armed and dangerous. 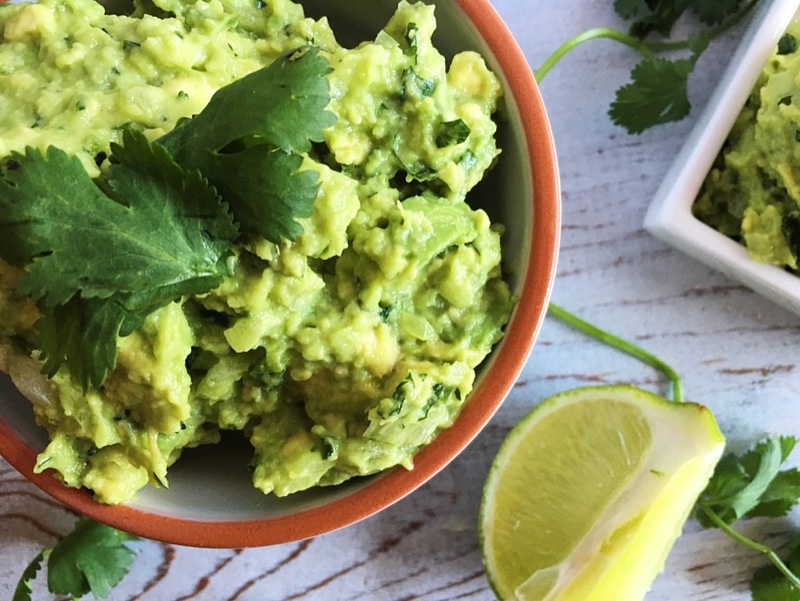 Time to get to the store and stock up on avocados so you can make a big batch of my No Fail Winning Guacamole! 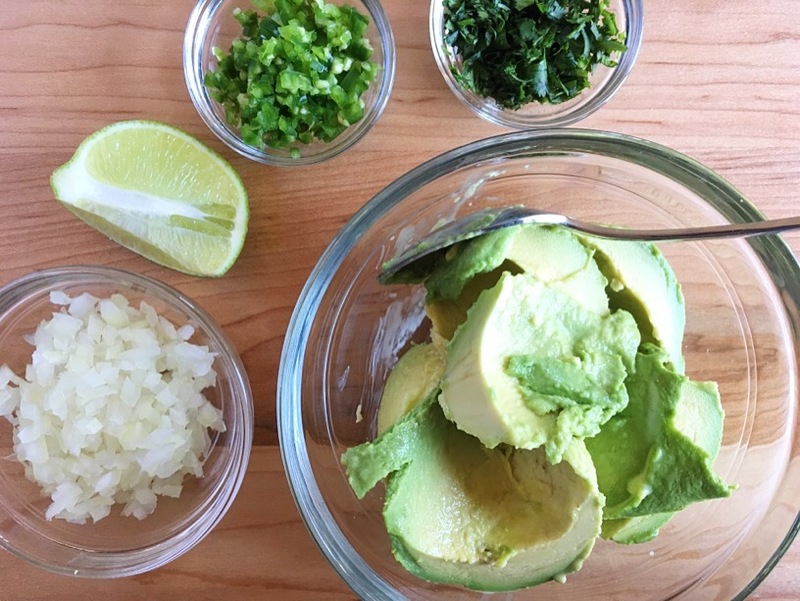 A recipe for delicious guacamole that works every time! 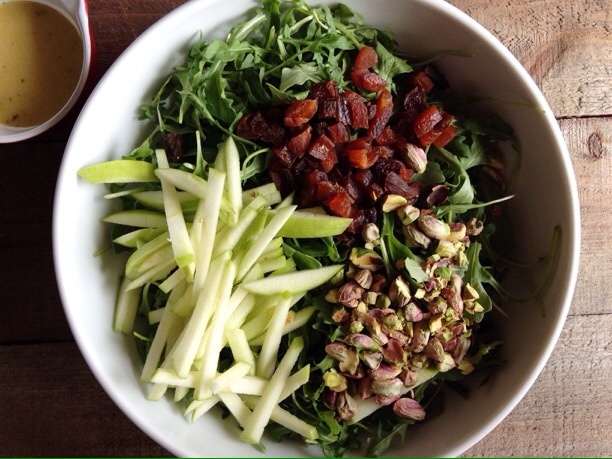 Scoop out the avocado flesh into a bowl and gently mash. Stir in the lime juice and salt. Mix in the cilantro, onion and jalapeño. *If you prefer your guacamole less spicy, remove and discard the seeds and membrane from the jalapeño before chopping. 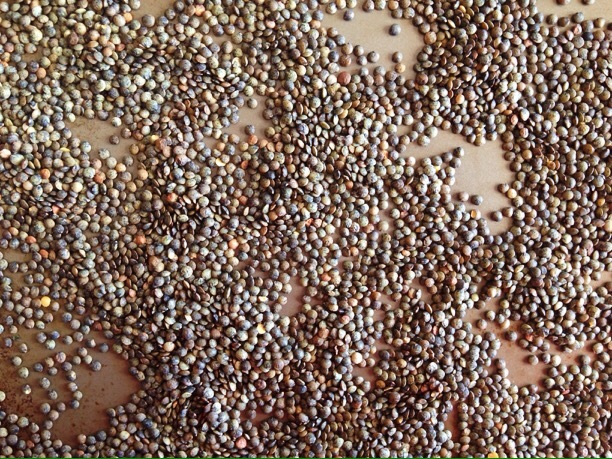 Careful, those seeds are hot, so best to remove them with a spoon or knife. 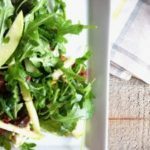 **Do raw onions bother you? 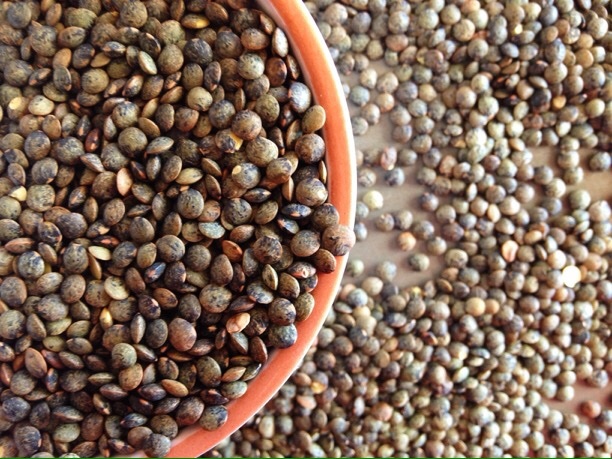 Try soaking them in water first before adding them to your guacamole. Makes about 1 cup guacamole. Oh dear! Luckily research has improved and we are no longer shunning fat. In fact, now we know that fat is vital to our existence. 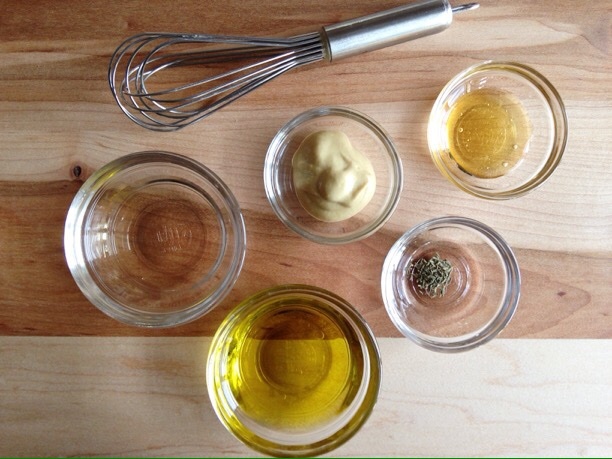 Fats provide energy, help us absorb fat-soluble vitamins, and can keep our hearts healthy. 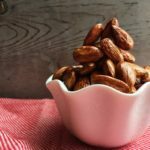 We just have to be smart about the type of fats we’re choosing and how much of them we’re eating. But I Can’t Eat as Much as I Want? 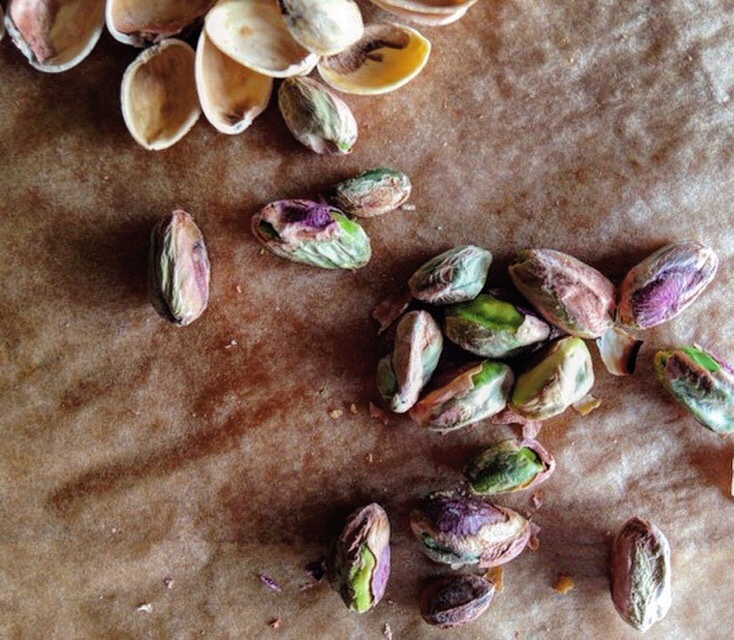 While all fats fit, it’s important to keep moderation in mind. Saturated and trans fats are the types of fats we should limit. Research is always on-going on this, and recently saturated fast have been in the news about not being as “bad” as we once thought. My advice? Stick with moderation. Go for the whole milk, but keep your serving to one cup. Enjoy that birthday cake, but choose the small slice instead of the massive monster piece. See where I’m going with this? Don’t over-indulge. It’s never wise to eat too much of one thing, right? Instead, focus on getting more healthy fats into your diet. We call those unsaturated (specifically monounsaturated and polyunsaturated) fats. 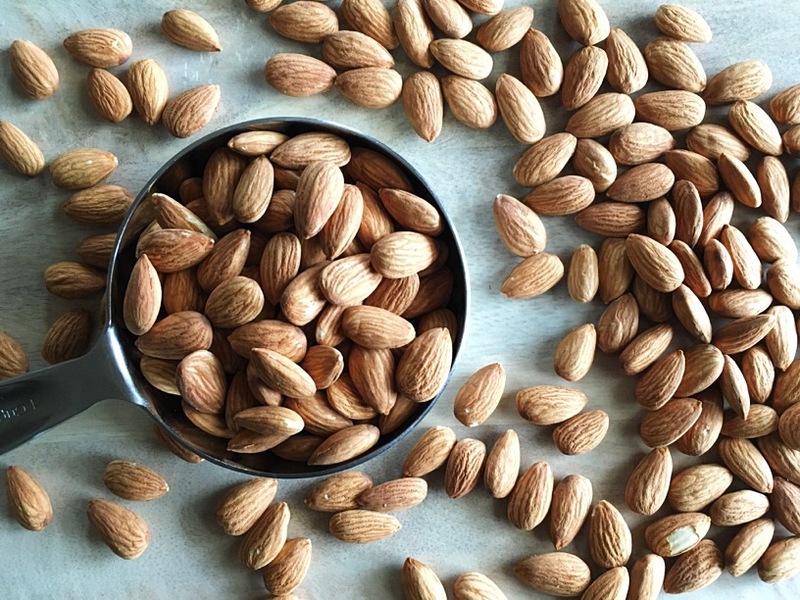 These unsaturated fats can also help support fertility by helping control blood sugar and tamper inflammation. Where do you find them? Great question! It’s easy! 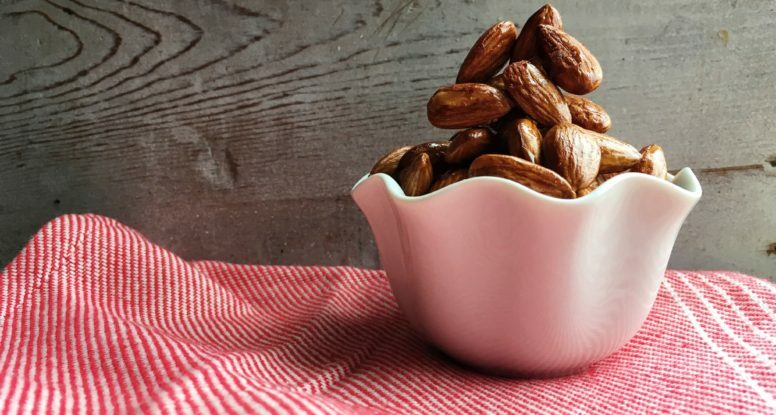 Eat fat, but make smart choices. 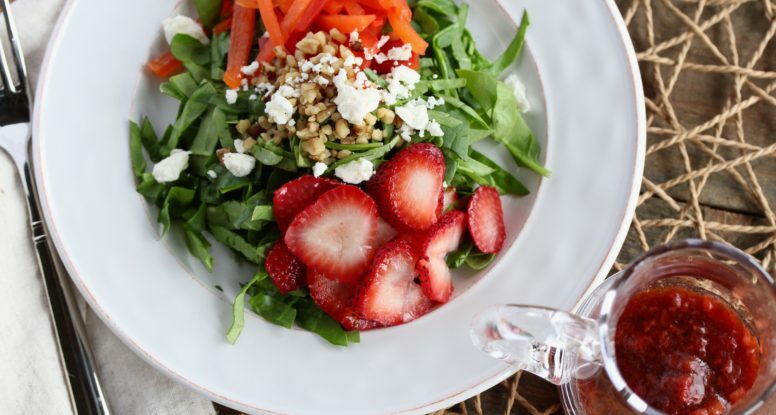 Stick with moderation and balance your intake with other foods. Eating this way just makes sense! Feeling inspired? 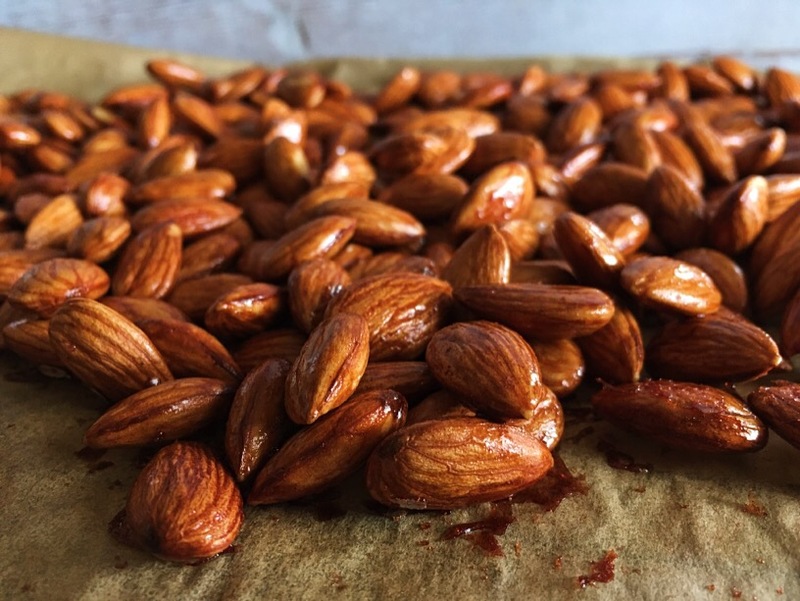 Get into your kitchen and make these yummy Maple Cinnamon Almonds so that you can enjoy some of those nutritious healthy fats! 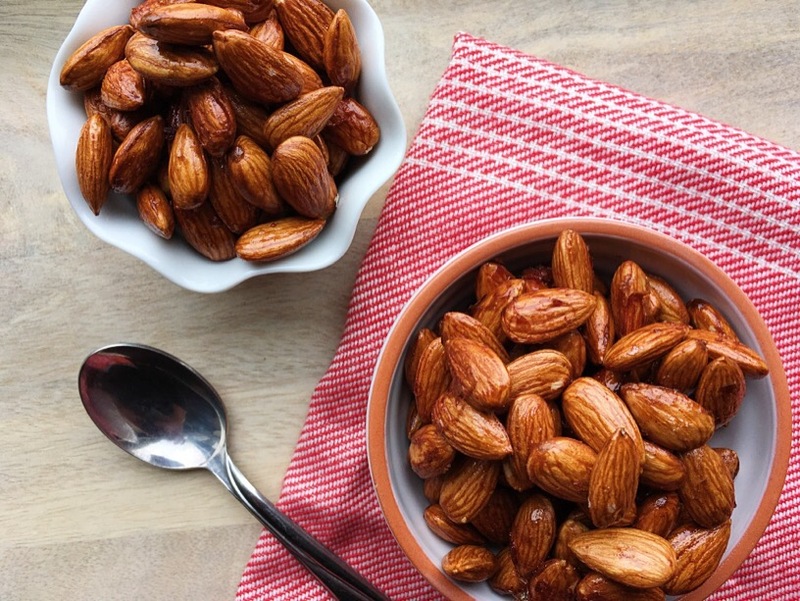 Super easy snack made with almonds, maple syrup and ground cinnamon. 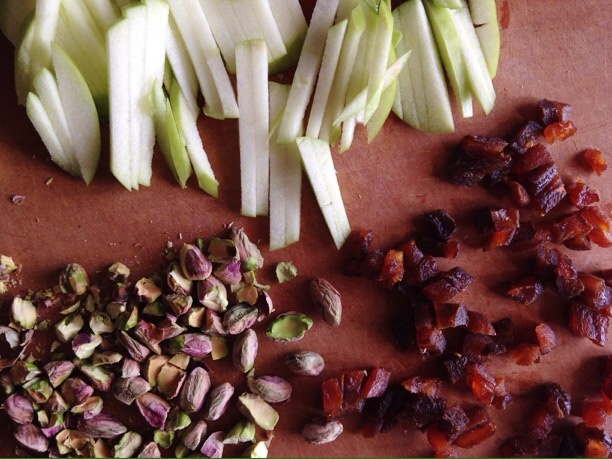 Preheat the oven to 300’F and line a sheet pan with parchment paper. Place the salt, maple syrup, water and cinnamon in a medium pot and set over medium heat. Bring to a boil and stir to combine. 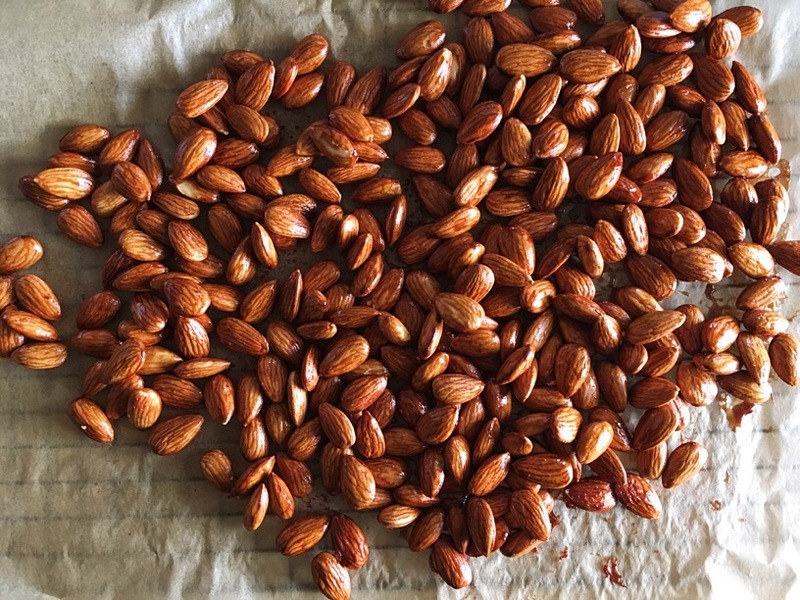 Pour in almonds and stir until almonds are well coated. Spread out on prepared sheet pan and bake 20 minutes, rotating the pan half way through cooking time. Remove and allow to cool before enjoying. “Simplify, simplify, simplify!” Henry D. Thoreau, eloquently and prophetically proclaimed in his famous work, Walden. That demand to simplify seems even more relevant today than it likely was in 1854, when Walden was first published. How many of us challenge that decree everyday? Adding more things that instead “complicate, complicate, complicate!” Ugh. Thoreau’s mantra is one I’m trying (somewhat successfully) to practice in my daily life. I’m not taking the easy way, but the smart, simpler way. 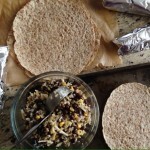 Case in point, I recently got so frustrated with making healthy lunches for my family. PB&J was in the lunch box more than I would’ve liked. Of course there’s nothing wrong with that sandwich, but variety is a good thing. 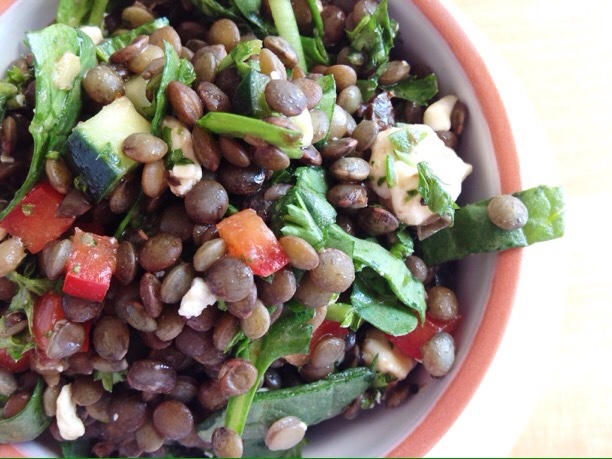 Inspired by Thoreau, I decided to “simplify” lunch. 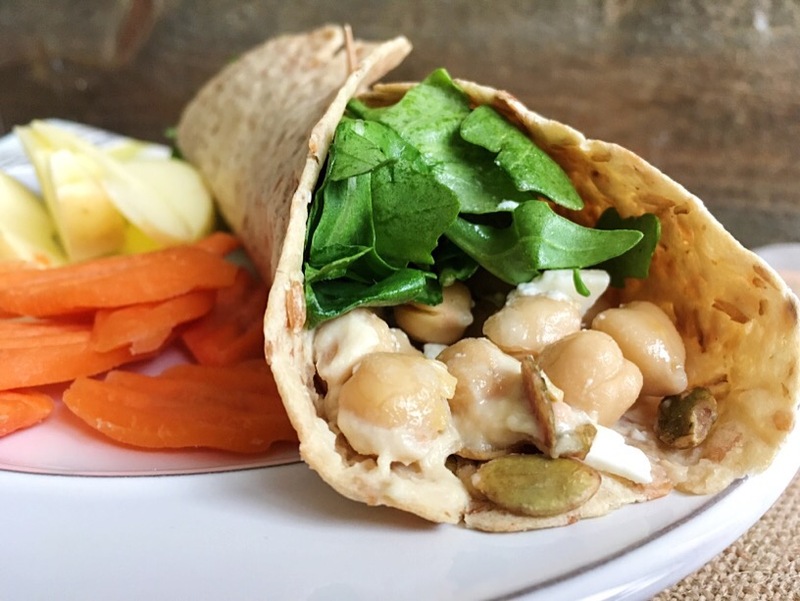 And with this Chickpea Hummus Wrap, I simplified on execution, but didn’t sacrifice taste or flavor! Yay! 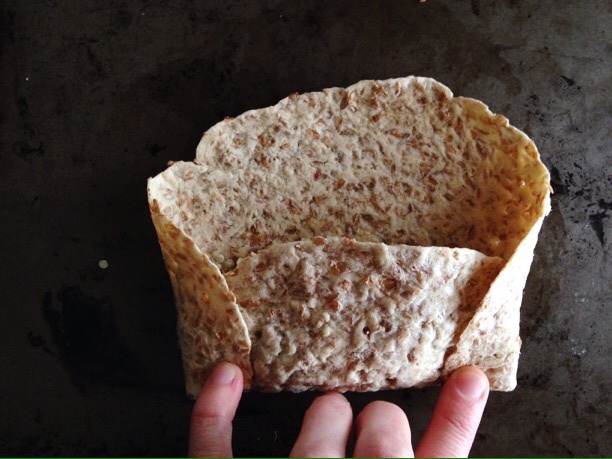 It all starts with a whole grain wrap and continues with layers of flavor. 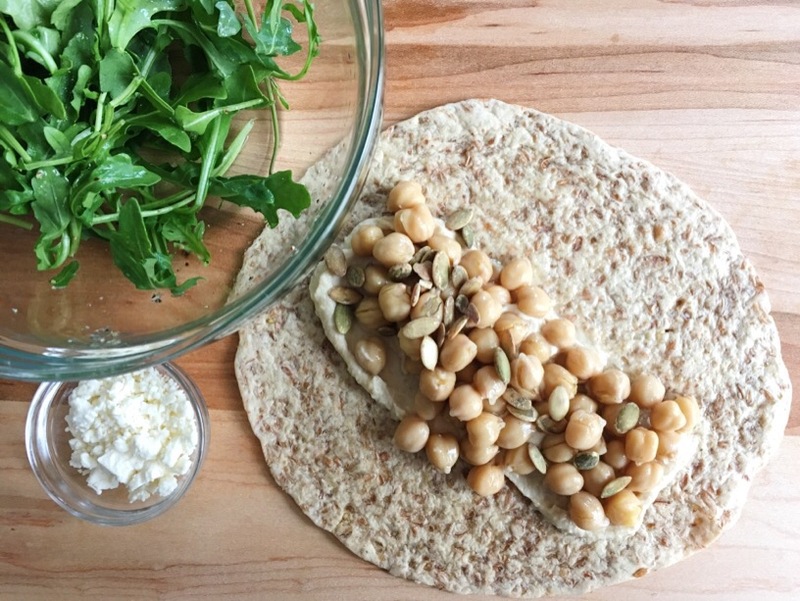 Canned chickpeas and pre-washed baby arugula keep things easy and fast. 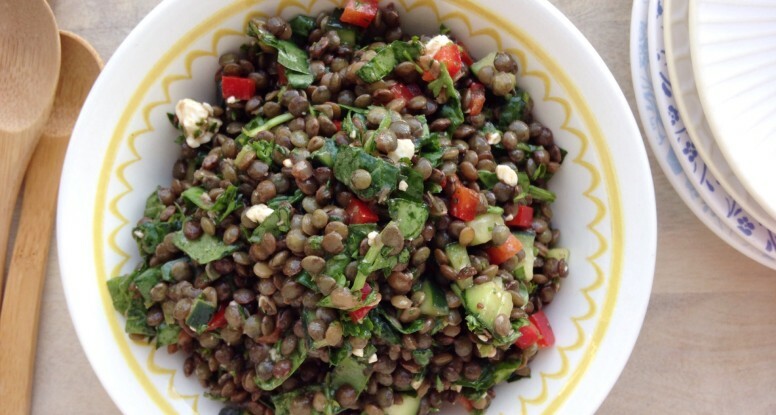 Flavor boosters like feta cheese and pepitas add a simple, yet tasty addition. 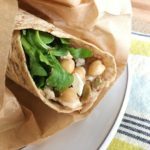 Luckily, the Recipe Redux theme for this month was how to get out of our “lunch rut.” How appropriate! 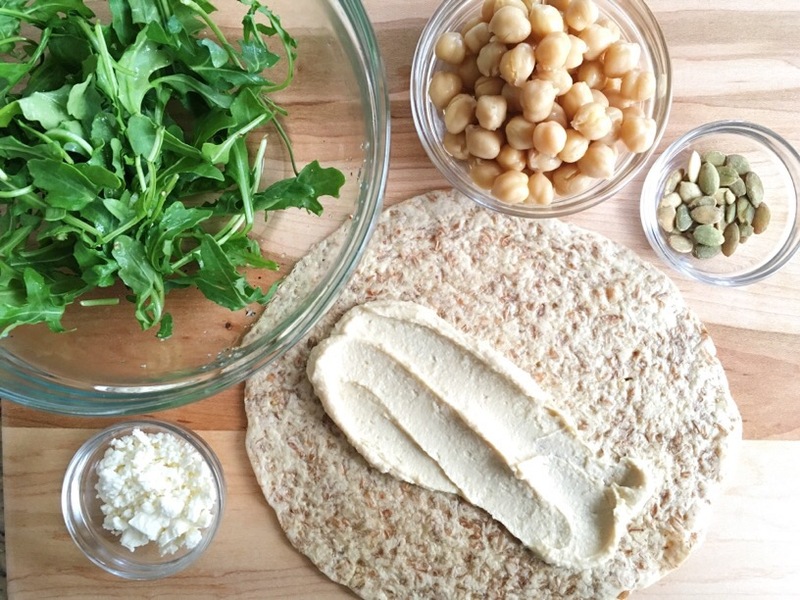 Fortunately I figured out just how to do that with this Chickpea Hummus Wrap! Time is of the essence! But don’t forget about good nutrition either! 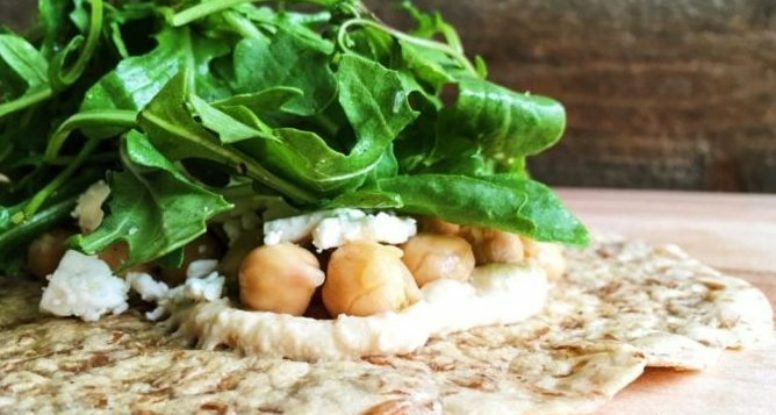 These simple chickpea hummus wraps make lunch easy, delicious and nutritious! 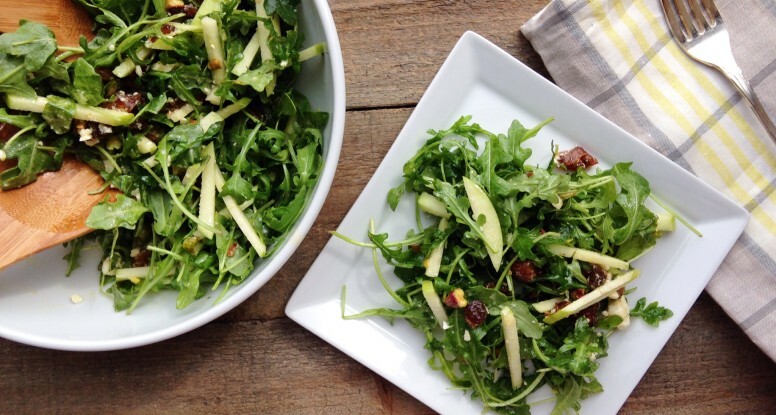 Toss the arugula with the lemon juice, black pepper and salt. 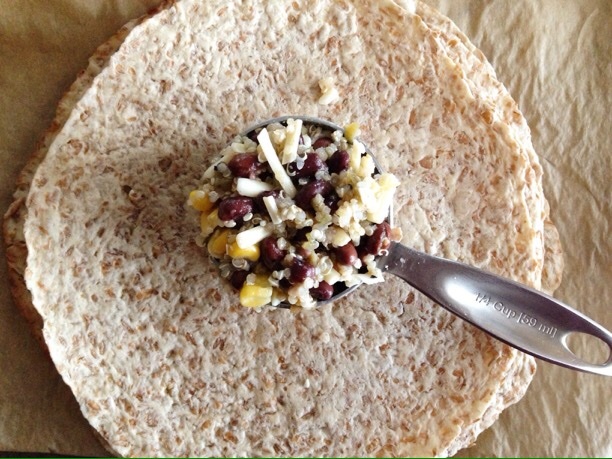 Lay tortilla on a clean work surface. 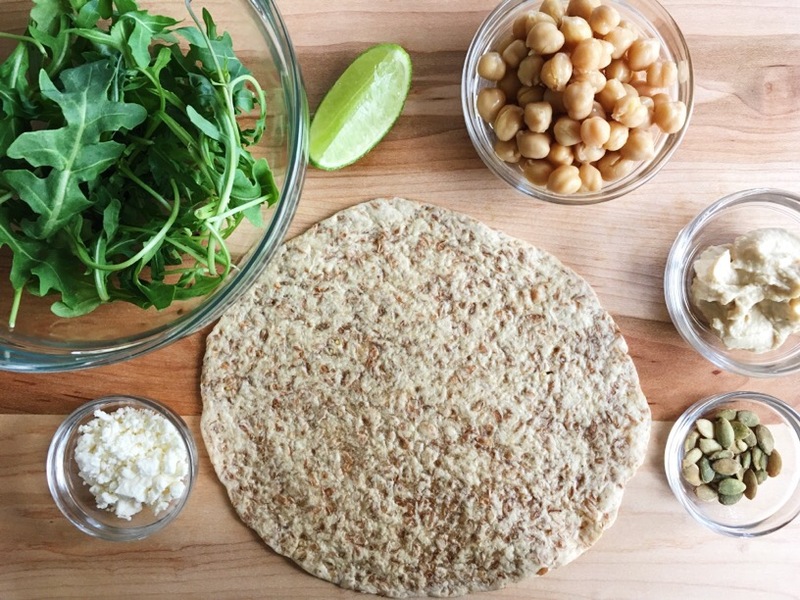 Spread the hummus down the middle of the tortilla and top with the chickpeas. 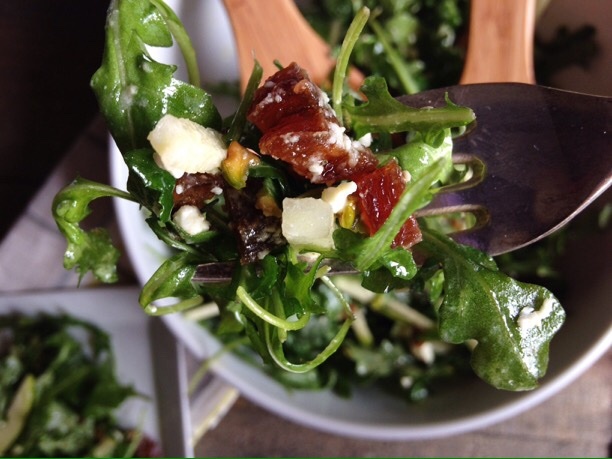 Sprinkle on the pumpkin seeds and feta cheese, then the arugula mixture. Want more? 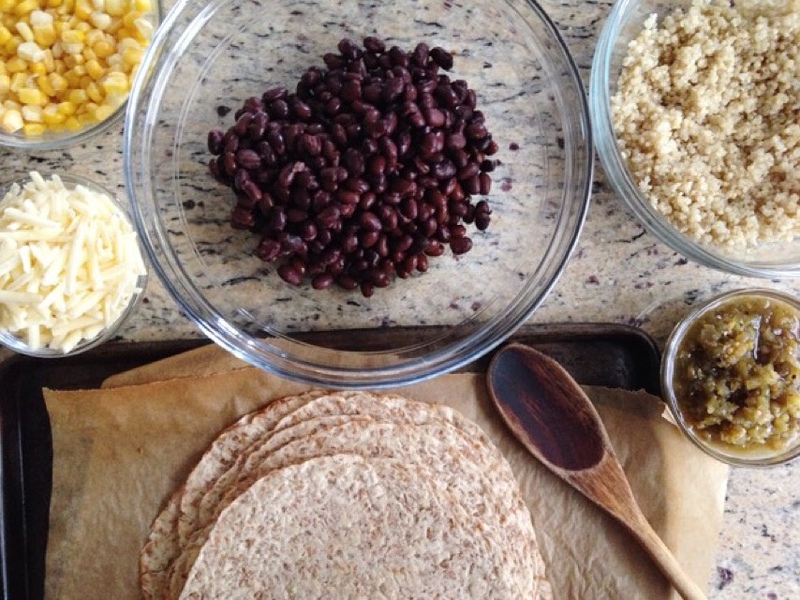 Just multiply ingredients by desired serving size and divide everything evenly among tortillas. Do you have 15 cents? 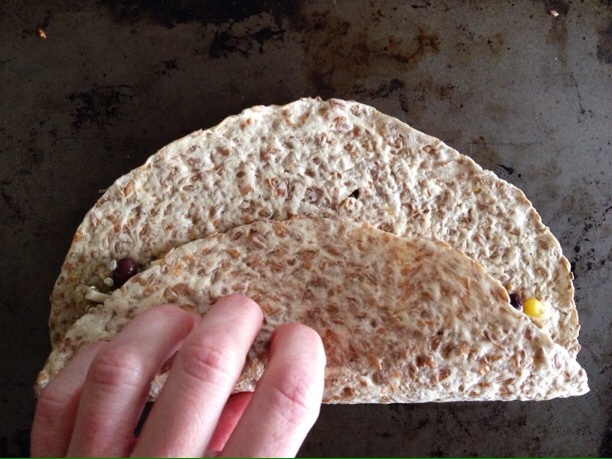 Here’s the deal, you could spend 50 cents on a lackluster burrito, or you could spend half that and have a tasty burrito loaded with nutritious ingredients. If you’re like me, you’ll choose the 15 cent burrito. 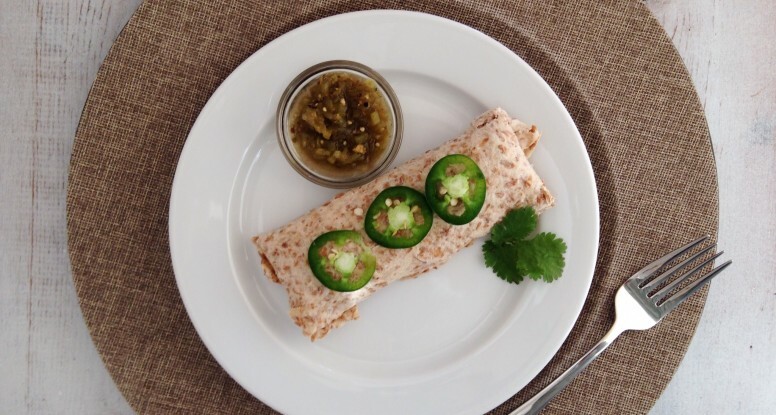 Not sure how to make this amazingly inexpensive, delicious burrito? Don’t worry, I’ve got you covered. 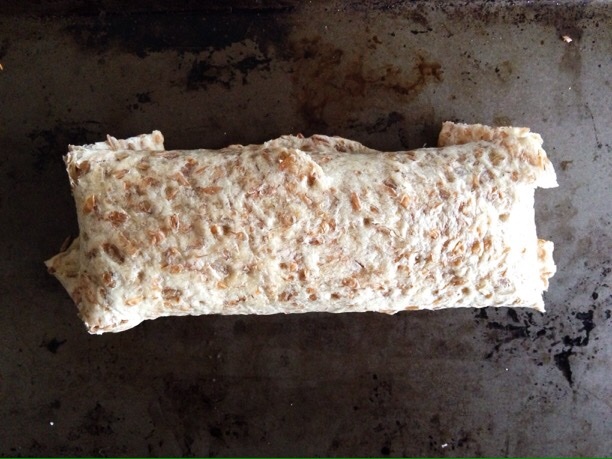 My Easy Freezer Burritos recipe is below and some pictures in case you need inspiration or instruction. There’s just something so remarkably fresh about them that makes me happy. At one of my old jobs, I had to make spring rolls on a relatively regular basis. During that time, I could crank out hundreds of those little guys. I would be tired, with a sore back and cross-eyed when I was done. But that didn’t deter me from eating the scraps or messed-up rolls. Ah, the memories! 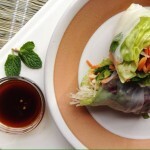 Veggies abound in spring rolls and that makes them a fantastic, nutritious choice. They are the perfect vehicle for so many kinds of veggies too. 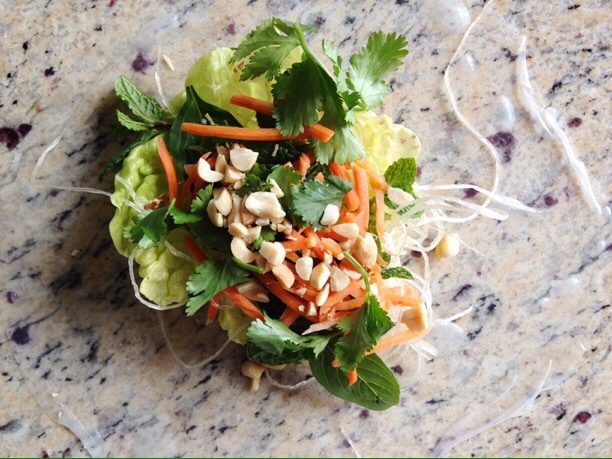 You don’t have to stop at carrots and lettuce (like my version below), you can add peppers and jicama for example. Really, just be creative and have fun with them. 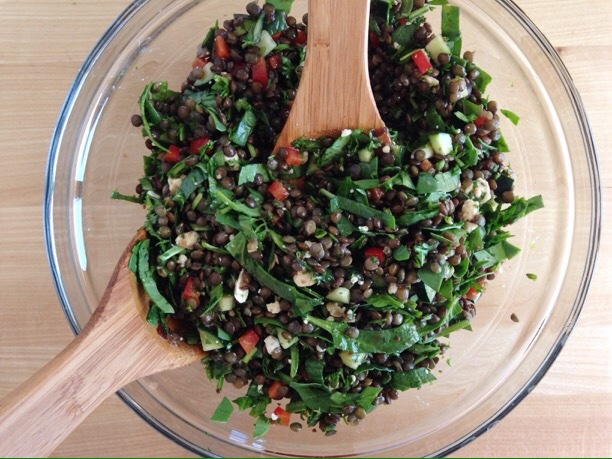 But don’t forget the basil, mint and cilantro, they are the key to flavor and offer their own nutritive bonus too. 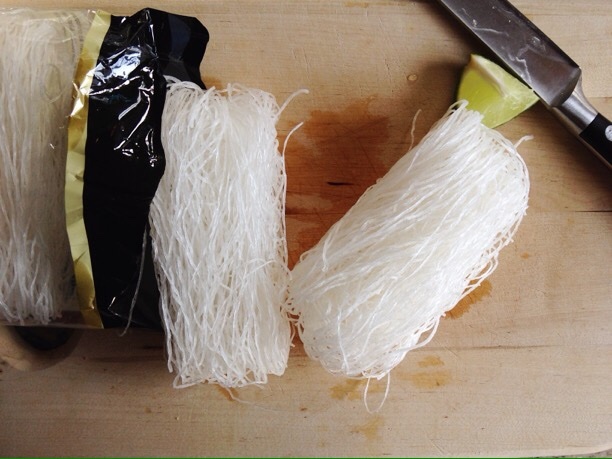 These are bean thread noodles. 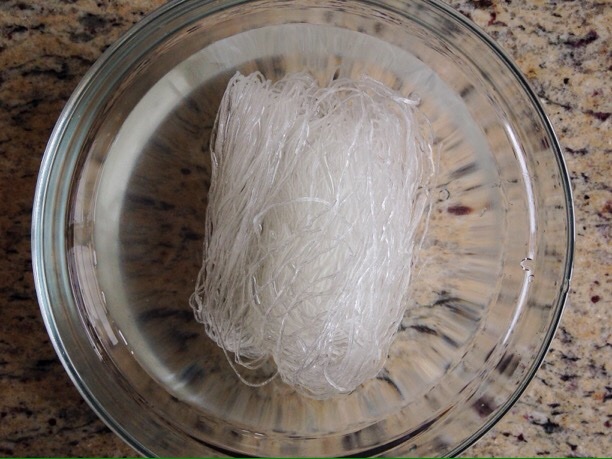 Simple to make, just pull out of bag and plop in some water. Watch them grow and feel them soften. Takes about 15 minutes and they’re done. 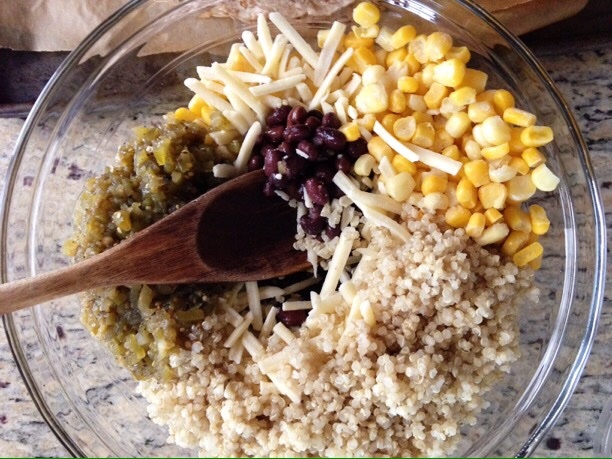 Get all of your ingredients together before rolling. Trust me on this one. 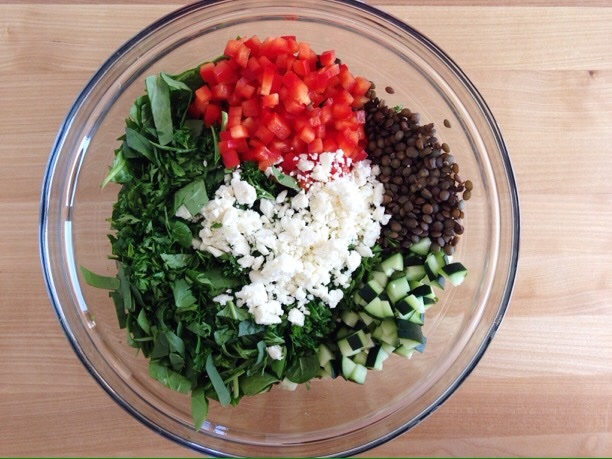 Look how yummy that is, even before you roll it! Roll ’em up! And don’t worry what they look like, ok? 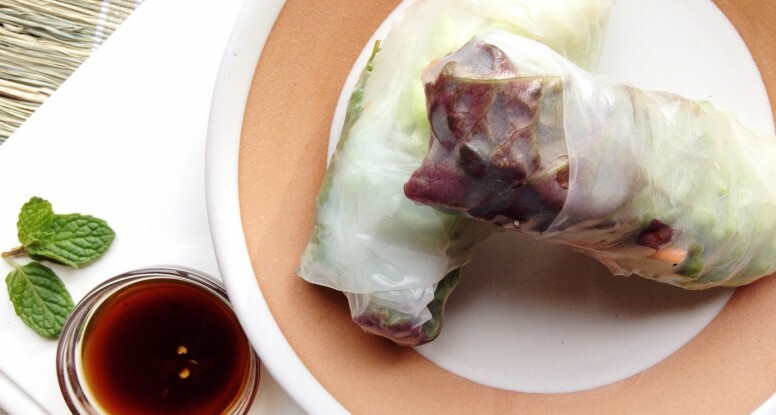 Refreshing and satisfying, these spring rolls are a perfect for an appetizer or light lunch. 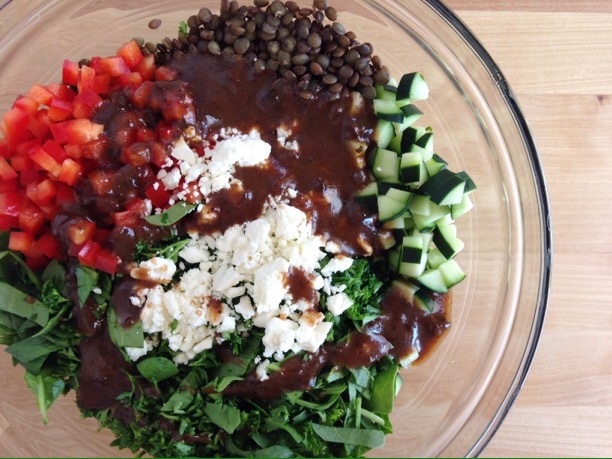 Combine the lime juice, honey, soy sauce, crushed red pepper and water in a small saucepan. Set the pan over medium heat and bring to a simmer. Simmer for 3-4 minutes, then remove from the heat and allow to cool. 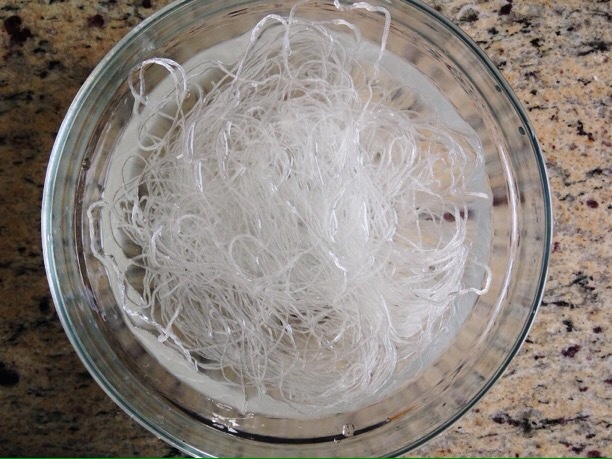 Toss 1-2 teaspoons of the dipping sauce with the prepared bean thread noodles. 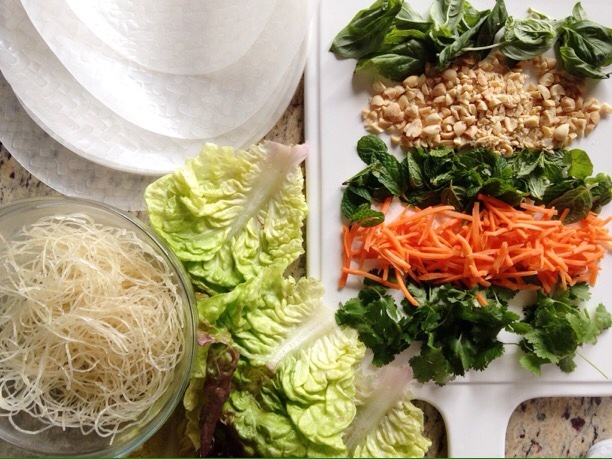 Prepare a large bowl of warm water for softening the spring roll skins and lay out all of the filling ingredients; the lettuce, carrots, peanuts, mint, basil and cilantro. 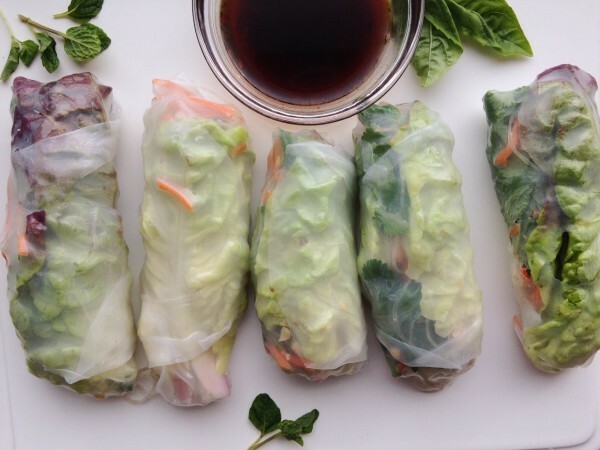 Slice rolls in half, if desired and serve with dipping sauce.